When the Gluten Free RN went on a gluten-free diet 11 years ago, her thyroid settled down and the associated symptoms and disorders—Graves’ disease, weight gain and hair loss—resolved. But when Nadine was inadvertently hit with gluten two years ago, several of those symptoms returned, along with a few new ones. She was losing hair and gaining water weight again. On top of that, her sinuses were congested. She developed asthma, a rash on her lower right leg and a scary case of pulmonary edema (excess fluid in the lungs). Hindsight being 20/20, Nadine realizes that her recent diagnosis of hypothyroidism is associated with that accidental gluten ingestion. Further study made it clear that there is a potential connection between her thyroid problems and pulmonary edema, as the leaky gut that comes with celiac disease can cause fluid shifts into body tissues. 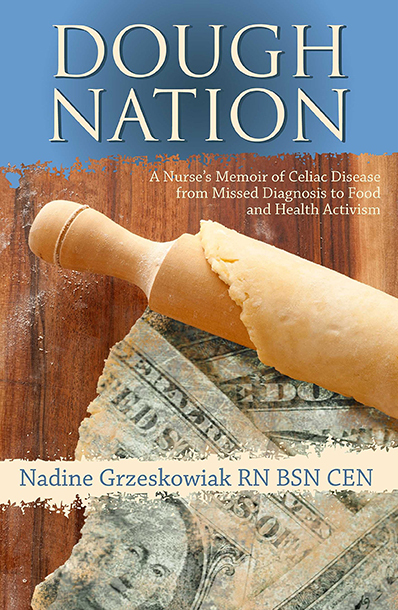 Today the Gluten Free RN explores the links among celiac disease, thyroid disorders and pulmonary edema. She explains the function of the endocrine system, the symptoms associated with hypothyroidism, and the diet she recommends for patients with thyroid issues. Listen in for Nadine’s insight around how gluten affects the thyroid gland and why the resulting low sodium levels might trigger edema in celiac patients.